I've been thinking, recently, about the term "realism" as it applies to comics and comic book properties. Now there are some genres where being more realistic. The Walking Dead (if you remove the whole zombie thing) or Strangers in Paradise only work with realistic portrayals of humans and technology. Superheroes don't, regardless of who the publisher is. 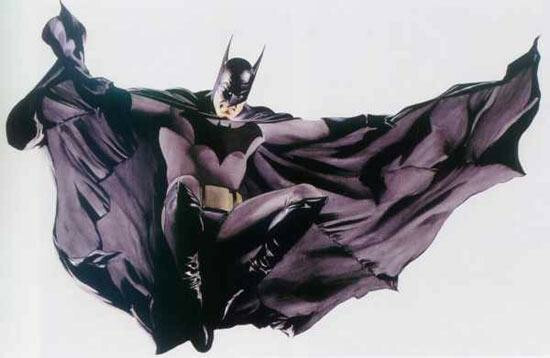 Any genre where a man who dresses as a bat in order to fight criminals, and isn't immediately shot, has no basis in reality. 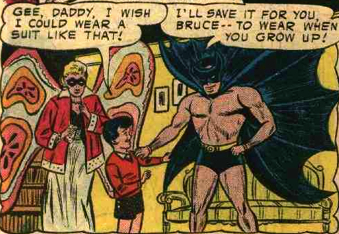 Yes, Batman is basically a man in a Halloween costume. It looks alright in a comic form, though. Don't get me wrong, I love it when superhero comics use real science or technology to solve a problem, and especially when they explain it to the reader. However, basing your whole comic/movie/tv show around a "realistic portrayal" of a superhero concept is just inherently flawed to me. It's kind of like the most common complaint of Alex Ross that I hear, which is his portrayal of Batman is "too realistic" since it literally is just a man in a suit. Alex Ross and his "too real" Batman. "Then you must not like any superhero movies, since they are all just men in Halloween costumes," you're probably saying. Nope. In fact, when you have a movie that embraces the genre, rather than feeling the need to explain every single thing, it makes for a more enjoyable experience. Since we're on the subject of a rich man running around in his PJ's, let's look at two different movie versions. Batman (1989) starring Michael Keaton presented Batman as already being around with minimal origin story flashbacks. The Batcave, Batmobile, Batwing, and all the utility belt objects have been developed before the movie. No time is taken, except for a brief scene during the party, to explain where any of this came from. Batman Begins (2005) starring Christian Bale, spends almost the first half of the movie, after an origin story, explaining where and how Bruce Wayne gets all of his equipment, costume, vehicle, and headquarters. Every piece of it has to be explained, to the point of having a conversation about dummy corporations purchasing two halves of the mask. Both are good films and I could watch each one at any time, but I enjoy Batman much more than Batman Begins, simply for the fact that it doesn't feel the need to explain what doesn't need explaining. I've already accepted the premise that a man is dressing up as a bat, you don't need to go any further. That's probably why I like the Marvel Studios films more than just about any other superhero movie, because they accept the comic book world that they are playing in and fully embrace it. Heck, they even made Batroc The Leaper a good character! I think this was covered in a podcast discussion as well, but I think that is going to have to be the key to any sucessful Fantastic Four movie. Start the movie in media res where the FF are already established. If you have to do origins, do it as limited flashbacks in strategic points and used the saved time not slaving over origins in the real story - the inter-relations amongst the characters and how it is being affected by the plot at hand driving this particular scenario. I think this is something we talked about on the 3rd Degree Byrne episode on the latest FF movie, but filmmakers really do need to tone the realism down. It's just not looking at the subject matter correctly.